This topic is extremely controversial and sensitive. 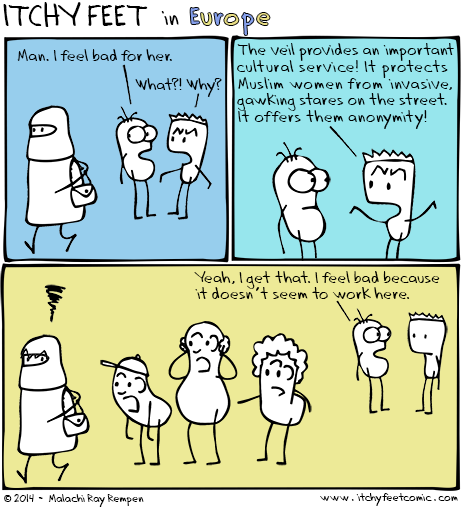 One can easily disagree with the idea that the veil provides an "important cultural service". Why should women hide themselves? Can't men be taught not to stare at women in the street? In my personal opinion the veil doesn't offer anonymity but deprives a woman of her identity. It wouldn't make me feel as uncomfortable if men wore it too. I get what you're saying. To me the veil is like a bikini - both are articles of clothing that women feel pressure to wear for the benefit of others, whether directly by the men in their lives, or indirectly through societal pressure. Women shouldn't have to hide themselves any more than they should have to bare themselves, but because our cultures expect certain attire, women might feel more comfortable dressed one way or another. Either way it's up to them. I don't feel pressured to wear a bikini. I usually wear a t-shirt cos it's frickin' cold in Ireland. 1- You're not supposed to wear a bikini in each and every place where you might encounter a male who is not from your immediate family. You wear it on the beach or at the swimming pool, which are very specific occasions that don't occur daily. And you can very easily NOT go to the beach or the pool. And if you DO go to the beach or pool, wearing a one-piece suit is not frowned upon by anyone sensible. 2- If you're not wearing a bikini (I have never ever worm in my entire lifetime btw; as a prenubile kid I wore only a bottom and as a woman a one-piece suit) -- you won't be shunned by society, called a whore or risk having acid thrown at your face. You won't be reminded daily you're unmarriageable and you're a shame to your family. Your comparison is so preposterous it hurts. Good points. I'm not saying they're exactly the same, of course that's preposterous. But you're also using extreme cases - not every single woman wears the veil to placate violent acid-throwing men. Many things in our culture, from clothing to language to food, has roots in traditional values which are no longer relevant to the person using or wearing or eating that thing. It is entirely possible for a Muslim woman to wear the veil just because she feels like it. It's not black and white, freedom vs. extremism. I'd also add that in *most* Muslim countries, the veil is not mandatory. Meaning, women can choose whether to wear it or not. She won't be called 'a whore' or considered a shame to her family, I think you're just watching too many American-made movies about Muslims. Acid throwing is also pretty much non-existent in Muslim countries, and it's not a Muslim-only issue. You'll find that, especially in North African countries, the face veil is also seen as an extreme form of covering up. Basically, Saudi Arabia =/= entire Muslim world.